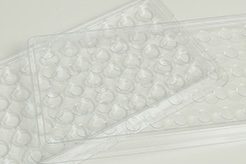 We manufacture standard trays to provide customers with Iwaki products more quickly and at lower prices. No matter how much care and devotion we use to manufacture products, if they don't meet customer delivery time or price requirements, they cannot be said to truly meet customer needs. Our desire to meet customer expectations is what prompted us to prepare our line of standard trays. Please feel free to contact us if you are interested in these products. They can be used in a range of applications, and we would be delighted to select just the right standard trays to meet your particular needs. Your feedback is what drives Iwaki's product improvements. 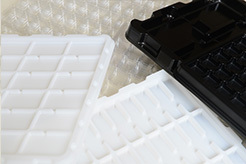 “We need trays for packing, but we are looking for one-shot products and we don't need repeat production, so vacuum forming would be too expensive.” Situations like these call for Iwaki standard trays. They are made using existing molds, completely eliminating initial costs such as mold design and fabrication costs. If you let us know how the trays will be used and what products they will hold, we will find the Iwaki standard trays that meet your needs. Cost is a critical factor for any business. We work in various ways to provide products that meet customer cost requirements. Please feel free to contact us with your needs. We will do our utmost to accommodate them. We meet the needs of customers who require their trays in a hurry. Iwaki also performs rapid made-to-order vacuum forming manufacturing, but if there is an Iwaki standard tray that fits your requirements, we can supply it even faster, as there is no mold fabrication time for standard trays. If you have already decided on your tray size and material needs, we can propose Iwaki standard trays that meet your needs. Business agility is highly influenced by turnaround time. In our modern age, where time is an asset, customers want their products to be delivered as soon as possible. 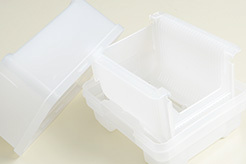 Iwaki also offers standard trays to shorten delivery times, providing customers with even higher levels of satisfaction. 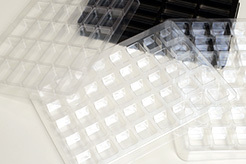 Iwaki's standard trays support high-mix, small-lot production. We offer a diverse lineup of standard trays in various shapes and sizes, such as trays with square, rectangular, and circular pockets, and with a wide range of pockets per tray and cutting dimensions. 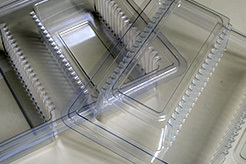 Customers can select from this extensive lineup, which includes large square pocket standard trays (external tray dimensions: 330 x 250 mm), small square pocket standard trays (external tray dimensions: 250 x 180 mm), substrate trays (for flat substrates, with cover), and our CD series for other shapes. We also offer trays which support 180 degree turning stack operation. Iwaki offers a rich lineup of standard trays, but we are always adding new sizes of standard trays. In addition to the lineup of standard trays indicated in our catalog and the standard tray pages below, we are constantly adding standard trays that meet customer size, quantity per tray, and shape needs, so please contact us with your needs. Iwaki has over 45 years of experience with creating various vacuum formed containers for use in packing, packaging, storage, and transport. 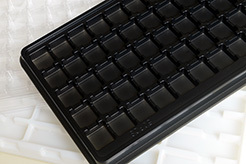 Our trays are available in materials such as normal, anti-static, and conductive materials. Let us know what you need based on your own usage requirements. We will do our best to meet your needs.